Located at Pasil, Santander, Cebu, Sanayon comes from the word “sanay” which means to multiply or abundance of harvest. Sometime in 1993, Sanayon Festival was held to display bountiful harvest from agriculture and fishing. These are the main livelihood of the town. Sanayon site has a beautiful and unique location where you can see the neighboring islands of Bohol, Siquijor, Sumilon, and Negros. Imagine a place where you can see all the four islands of Region VII. 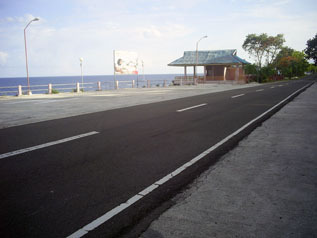 Presently, it is used as rest area with facilities to welcome visitors and tourists. When you reach Sanayon site, you know that you are already in Santander and the landmark in it is the statue of “SIGBIN”.